A knocked-out Panzerjager (tank destroyer) V Jagdpanther SdKfz 173 is examined by an American soldier, probably of the 9th Army. 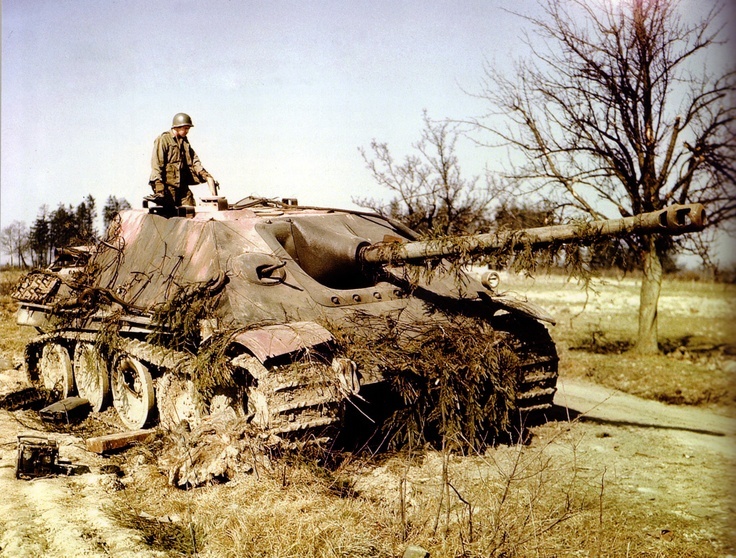 While the date and place of this photo is disputed, the red primer on the vehicle, the soldier’s uniform, and the absence of leaves on the trees probably indicate that it was taken during the Americans’ advance into Germany in March-April 1945. Since civilians and sodliers would strip knocked-out tanks of anything useful, it’s likely this photo was taken within a week of the tank being destroyed. It’s possible this was a Panzer Lehr Division vehicle. The impact of anti-tank rounds can be seen along the road wheels. This vehicle has an early version of the 88mm (3.46 inch) Pak 43/3 L/71 gun that was a single tube; later versions of the Jagdpanther had two joined tubes that comprised the gun barrel. 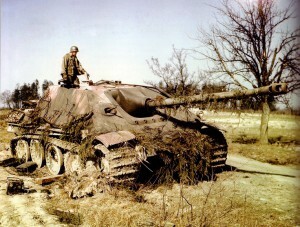 The gun mounting is a later version, indicating the barrel was replaced at some point with an earlier version, or this vehicle was built just as the factory was transitioning to the late model Jagdpanther. Widely considered to be the best tank destroyer of the war, the Jagdpanther was available in small numbers to units, as only 400 were made between December 1943 and the end of the war.